Oh yeah. I have a blog. Life has been a little crazy lately. We're in the process of moving, a process which started earlier this year and won't be complete until at least January of next year. We're currently living at my parents house while most of our stuff (including about two thirds of my polish) is in storage. Also, I'm pregnant! It's a boy, due January 7th. So with all of that going on, I haven't really had the time to do much with my nails or been in the mood to photograph them. I'm getting back into the swing of things, though! This is Milani Gold Glitz stamped with L'Oreal Downtown Chic and plate VL002 by Vivid Lacquer on Etsy. I love Gold Glitz. It's part of their One-Coat Glitters line, although I prefer two coats of this one. 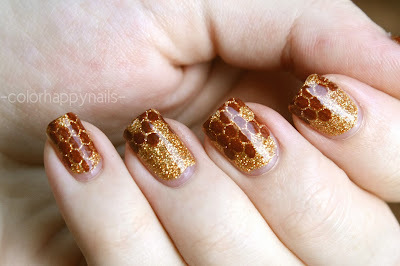 It's a blend of fine gold and copper glitters in a clear base. The glitter is very dense, but it goes on very smoothly and evenly. It will tend to settle if left for a while, but mixes up very easily again with a little shaking. I don't know what voodoo they used on this stuff, but it's one of the easiest glitters to apply I've ever used. It is a thirsty glitter, so I recommend a couple coats of topcoat. Interestingly, though, without topcoat it has a little bit of that sandy, textured finish that's popular right now. 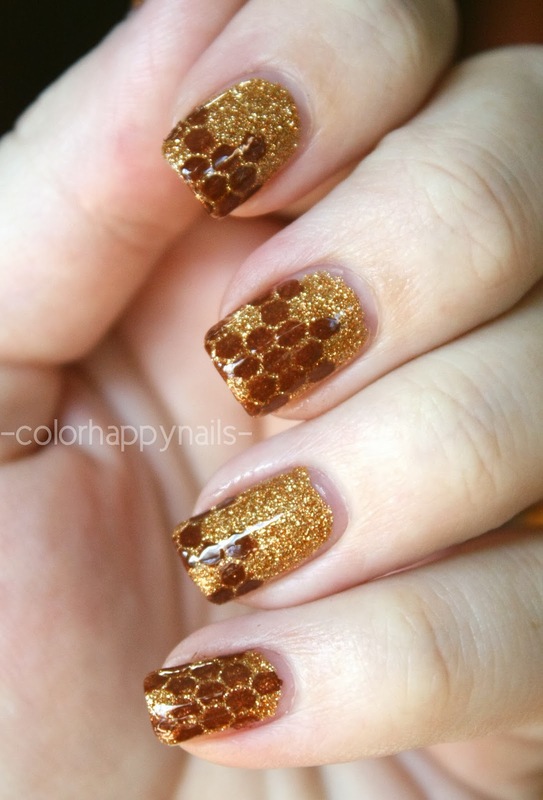 Below is two coats of Gold Glitz.